Fall and winter months can be especially challenging for children. Their underdeveloped immune systems and picky diets often lack vitamins and nutrients. 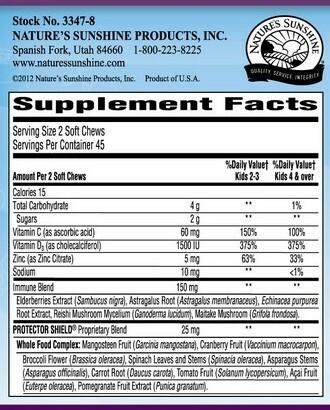 Sunshine Heroes Elderberry Immune soft chews provide key vitamins, minerals, herbs and other nutrients that play essential roles in building and maintaining healthy immune function, including vitamin D and elderberry. Mounting evidence shows that in addition to supporting bone health, vitamin D is critical to the immune system. Vitamin D shortages are now being recognized as widespread in the United States, prompting health officials to plan an increase to the Recommended Daily Intakes for children and adults. Scientific evidence suggests that vitamin D offers a variety of benefits to the immune system, including enhancing innate immunity. In fact, vitamin D receptors are present on activated T- and B-lymphocytes, monocytes and macrophages-all important components of the immune system. Elderberry fruit contains flavonoids-antioxidants that help support the immune system. 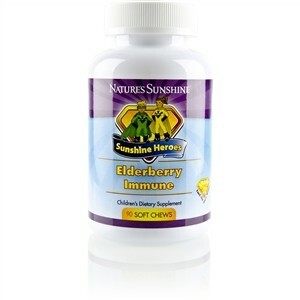 Elderberry has been widely studied and found to boost the immune system. A randomized double-blind, placebo-controlled study found that people who received elderberry extract had significantly stronger immune system response compared to a placebo group. for my grandson Review by Jean E.